Hundreds of brain building puzzles in increasingly challenging levels. There is a lot of repetition of puzzles, but each one does get more challenging than the last. Whether you’re looking for something to keep the kiddos occupied during your travels home for the holidays, or the perfect educational gift to put under the tree, you can’t go wrong with word games. They help get kids thinking, and they keep them occupied without the glare of a screen. 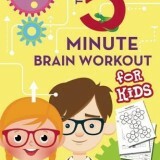 The 5 Minute Brain Workout for Kids is a sturdy softcover volume filled with 365 pages of brain working fun. There are colorful illustrations to keep things fun, and ten different levels of puzzles to keep things progressing steadily. This is a book designed to get kids thinking in different ways, and it uses a variety of games and puzzles to do so. As the introduction explains, there is a difference between the two. All of the puzzles have a specific answer, and kids will have to work a little to come up with the correct solution. The games, on the other hand, are meant to be a fun break, and many different answers will work. For example, in the Alphabet Teasers I game, you are given a grid with different letters, and you need to come up with an animal, place, and boy’s name that begin with each one. There are any number of solutions to it, but they all must begin with the correct letter. The crossword puzzles, on the other hand, require kids to come up with one correct answer that will fit the spaces. There are a number of different activities in the book, ranging from word finds to writing sentences to sudoku. The book is separated into ten different sections, with each one being a little bit harder than the one before it. I liked that, as it makes the challenge of the book grow as they get more practiced at playing the games. The games themselves, however, are repeated in each level. For instance, you’ll do a different crossword puzzle in each of the ten levels, and so forth. While it does seem to be a bit overly repetitious, on the other hand, once kids have mastered the basic idea of each game, they’ll be able to attack the next level confidently. The 5 Minute Brain Workout for Kids is a fun choice for parents looking to amp the educational level on free time. 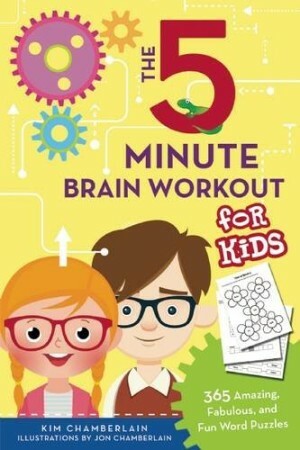 Whether your kids go for one puzzle a day, or tear through the whole thing in a few hours, it offers hundreds of brain building games to keep them busy.